This is what most consider the hardest part of the installation. We encourage all installations be done by a professional certified technician. The AX-TOYUSB-2 Is Used When You Want To Retain The OEUSB Port On Select Toyota Vehicles (Radio Utilizes RearUSB Input). Tundra (Non-NAV ) 2010-2013. Tacoma 2012. Sequoia (Non-NAV ) 2010-2013. Matrix 2011-2012. IDatalink HRN-RR-TO1. Car Stereo Factory Integration Adapter. Works with Maestro ADS-MRR module to allow installation of new car stereo in select Toyota vehicles. 10-pin to 20-pin JBL adapter. 20-pin SWC adapter. Best Kits Part Number: BHA8110. For use with 1990 - 2002 Toyota vehicles with premium sound. Harness has 15 pins. The "Digimarc-Enabled" Web Button is a trademark of Digimarc Corporation, used with permission. iDatalink HRN-RR-TO1 Factory Integration Adapter Connect a new car stereo and retain steering wheel controls and factory amp in select Toyota-made vehicles Features: works with Maestro ADS-MRR module to allow installation of new car stereo in select Toyota vehicles retains the use of your steering wheel audio controls and factory amp retains select factory features and displays performance data on touchscreen with select Alpine, JVC, Kenwood and Pioneer receivers What's Included: 15" Vehicle/radio harness 10-pin to 20-pin JBL adapter 25" Backup camera harness 20-pin SWC adapter 28-Pin SWC adapter 50" OBD harness . Axxess MITO-02 Amplifier Interface Harness w/Amplified System FREE CELL ANTENNA. 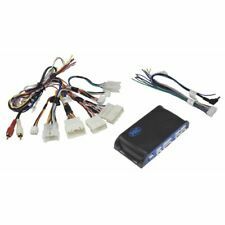 Amplifier Interface Harness for Select 2007-2009 Mitsubishi Vehicles with Factory Amplified System. for Select with Factory Amplified System. Designed for amplified models. Venza 2009-2012. Venza (w/ SD card based nav) 2013-2014. Tundra (Double Cab) 2004-2005. Tundra 2006-2013. Tacoma 2005-2013. Sienna 2004-2014. Sequoia 2005-2012. All wiring harness includes power and speaker wires and each is labeled with its specific function. The wiring color codes are ISO standard. Avoid cutting the factory harness, so all connection are exactly right. AXXESS AX-TOYCAM1-6V. 2014 Rav-4 (date build pre-Nov. Self installation voids the warranty if any. We may require receipt of professional installation/bench Test report to establish it was professionally installed and the issue was with the product and not installation. ). Amplifier Integration Harness Includes RCAs . Toyota Prius (2009-2013All models with Most connector. All wiring harness includes power and speaker wires and each is labeled with its specific function. The wiring color codes are ISO standardFits to ). Connects speakers to factory harness. 4 Total Harnesses Included - 2 Pairs Included. Includes retention tab for factory wire retainer. Speaker Harness Adapters for select Honda, Acura, Isuzu Vehicles. IDatalink HRN-RR-T02. MAESTRO TO2 HRN-RR-T02 / TOYOTA HARNESS TOYOTA 2012 - 2016 NEW RELEASE. T02 - Plug and Play T-Harness for T02 Toyota Vehicles. Installation Accessories. Radio Installation Kits. After that we will put the item back for sale. Speaker harness for Nissan Vehicles. Allow the user to retain their factory speaker connectors while installing a new set of speakers without having to splice into factory wiring. It is important to us that if you see our products being used in the lanes, that you have access to obtaining those products. Connects speakers to factory harness. 4 Total Harnesses Included - 2 Pairs Included. Includes retention tab for factory wire retainer. Speaker Harness Adapters for select Mitsubishi, Scion, Toyota Vehicles. Reverse Wiring Harness for Select GM Vehicles (14/16 Way). Plugs into. The interface programs itself to the components it is being installed with. Automatically detects the vehicles OEM interface and will program itself to it. Car stereo requires a wired steering wheel remote input. IDatalink HRN-RR-TO1 Factory Integration Adapter. works with Maestro ADS-MRR module to allow installation of new car stereo in select Toyota vehicles. 10-pin to 20-pin JBL adapter. 20-pin SWC adapter. Plugs into Car Harness at radio Power 4 Speaker . 1987-2007 TOYOTA AND SCION VEHICLES. For select 1987-2007 Toyota and Scion vehicles. WIRING HARNESS FOR SELECT. Plugs into car harness at radio. No cutting of factory wiring needed. Gray with Black Stripe – Right Front Speaker (-)Compatible with the following vehicles. Comes with 70-7001 Has only power wires and no speaker wires DIN plug with RCA plugs Applications Dodge Stealth 1994 Mitsubishi All 1994-2004 Infinity System . Plugs into Car Harness at radio . Best Kits Part Number: BHO1761. For use with 1987 - 2012 Toyota vehicles. Use with an OEM factory radio. Speaker Harness Adapters for select Mitsubishi, Scion, Toyota vehicles only. It is important to us that if you see our products being used in the lanes, that you have access to obtaining those products.